The sodium urine test measures the amount of sodium in a certain amount of urine. Sodium can also be measured in a blood sample. After you provide a urine sample, it is tested in the lab. If needed, the health care provider may ask you to collect your urine at home over 24 hours. Your provider will tell you how to do this. Follow instructions exactly so that the results are accurate. The test is often used to help determine the cause of an abnormal sodium blood level. It also checks whether your kidneys are removing sodium from the body. It may be used to diagnose or monitor many types of kidney diseases. For adults, normal urine sodium values are generally 20 mEq/L in a random urine sample and 40 to 220 mEq/L per day. Your result depends on how much fluid and salt you take in. The examples above are common measurements for results of these tests. Normal value ranges may vary slightly among different laboratories. Some labs use different measurements or test different samples. Talk to your provider about the meaning of your specific test result. Batlle D, Chen S, Haque SK. Physiologic principles in the clinical evaluation of electrolyte, water, and acid-base disorders. In: Alpern RJ, Orson WM, Caplan M, eds. 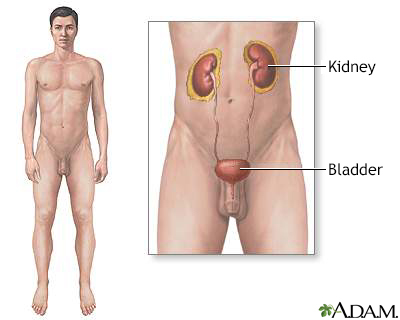 Seldin and Giebisch's The Kidney. 5th ed. Philadelphia, PA: Elsevier Saunders; 2013:chap 74. Kamel KS, Davids MR, Lin S-H, Halperin ML. Interpretation of electrolyte and acid-base parameters in blood and urine. In: Skorecki K, Chertow GM, Marsden PA, Taal MW, Yu ASL, eds. Brenner and Rector's The Kidney. 10th ed. Philadelphia, PA: Elsevier; 2016:chap 27.